"Humility is the virtue that requires the greatest amount of effort." Thank you Micki, for introducing me to another Saint I had not heard of before. Lovely icon style holy card and an inspiring quote! A daily blessing delivered Micki Thank you!! Micki, hi again! I don't know if you remember me, we emailed back and forth about St. Catherine of Alexandria. I was wondering if you have any of St. Ursula that you wouldn't mind sharing? Anne - Just so very difficult to put into practice....but, with His help all is possible. diddleymaz - So happy you could meet her..hope you com to love her also. I think the icon style is very interesting. Not my favorite but interesting. Kelly - Please email me your email address. 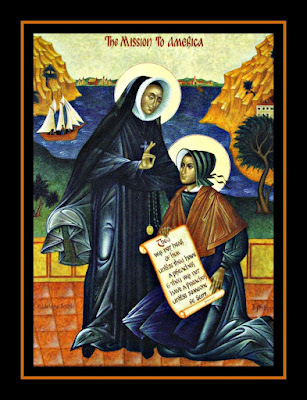 Faint notations on the card indicate that the standing figure is St. Madeleine-Sophie Barat and the kneeling figure is her "daughter in religion," St. Rose Philippine Duchesne.